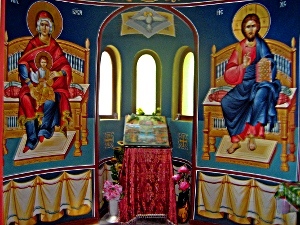 Atanas Paskalev, village of Borovo, host of "Holy Trinity" - Cross forest. My grandfather, who was a churchwarden and my uncle were the most active members in the building of the church "Holy Trinity". That was in 1956. My father used to say that during the building process, they took rocks from the wall of the former monastery. They're building some of the walls to date as well. But even before the cross was brought there in 1936, people went there because the place has healing capabilities. Everyone was taking a little rock for health and for a protection against bad people and evil powers. Every rock there is marked with a cross. I was going up there, when I placed the cross, even though I was still a kid. I'm helping around to a Russian guy - he was a priest in our church. I remember Jordan, who in fact started the whole initiative. He was with a small beard and long hair. Very religious man. My mother have said to me, that when I was very young, I’ve always been sick. She has sent me to a monastery to work there for a month. I didn't managed to go the Bachkovo or any other monastery, but when I grew up and started to build the church "Holy Trinity", I went there and worked for 20 days. While we dig, we dig out many precious things. I don't know where they were sent.. to the police or in some museum.. We digged them from the foundations of the old monastery. But there, every rock is valueable. If you look around, you'll see either an image or a cross on every stone. There's something in the whole story, that we placed the cross in 1936, and only year before that, the church in the village of Borovo had been built. Built by the Hadji from Momchilovtzi. Great master, stone-cutter and a mason. He went to the Holy Sepulchre, worked in many countries, won many prizes. He worked for the building of the church during the Russian priest. He also was a very good man, a people's person. Petar Koleshev was his name, he was like a doctor. He knew everything about anything, he got a medicine for every illness. Nicola Damyanov, an archeologist, director of the Historical Museum. I was on a museum expedition to the Cross peak several times. One time in 1972 and later in 1980 and 1982. There the little chapels exist next to ruins, which probably date back to the middle ages. We found out coins - heavy deformed, from the Komnin's dynasty - early mediaeval times. In the foundations of a ruin we found heavy fragmented pottery from byzantine - mid and late mediaeval. A bronze cup was found - a holder for icon-lamp. We concluded that, on the Cross peak, there were a Christian presence after XI-th century. But for a more precise period to be dated, a further archeological examination must be done. It's logical to be found even more ancient culture, but probably in more deeper culture layer. I assume that there existed an old Thracian sanctuary, that by tradition continued the be used for a place to pray. I'm confident that if a more serious studying is conducted it will definitely confirm the presence of early Christian culture from the end of IV-th century exists. The found holder for an icon-lamp gives me an opportunity to claim that on the Cross peak, there is a Christian succession, continuing even in the period of the Revival.